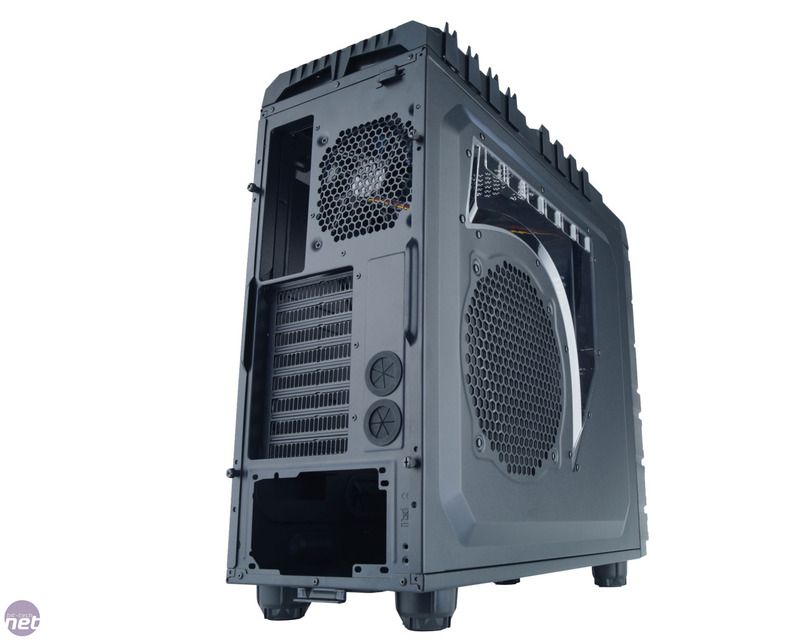 What this means in practice is that the Overseer RX-I has a chunky, futuristic styling, as seems to be the norm for cases that are aimed at gamers. Harry got it right when he casually remarked that the case looks like Optimus Prime’s cigarette lighter. 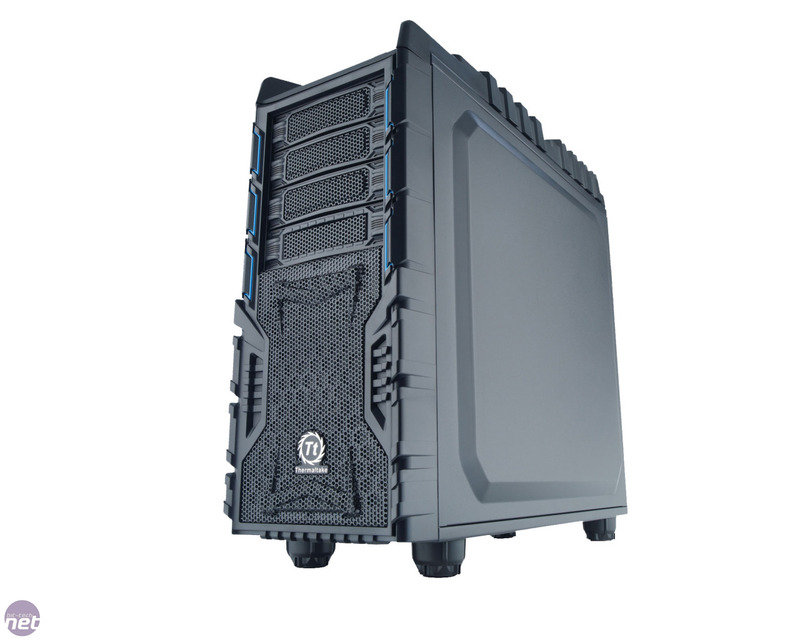 Thermaltake has really gone to town with the looks too; both the roof and fascia are festooned with plastic ridges and fins, and the two side panels have extruded central sections, adding to the ammo crate aesthetic. The plastic on show is of reasonable quality, as it doesn’t bend or creak too much when the case is handled. However, we did notice that two of the four clips holding the front fascia onto the steel chassis of our review sample had shattered, meaning the panel wasn’t attached overly securely. 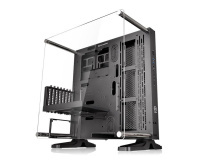 The side panels of the case attach through the use of traditional thumbscrews, and the right hand panel has both a C-shaped window and a large 200mm fan mount built into its extruded section. The fan mount is handily fitted with a dust filter; a simple and effective inclusion that's lacking in other cases, such as the Corsair Carbide 400R. 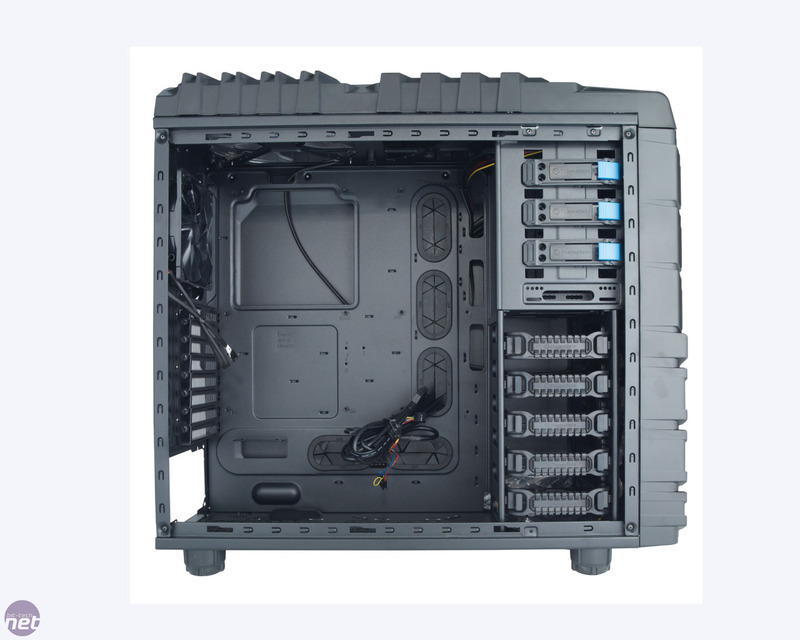 The right hand panel also features an extruded section, which is useful as there would otherwise be very little room between the motherboard tray and the panel for routeing cables. 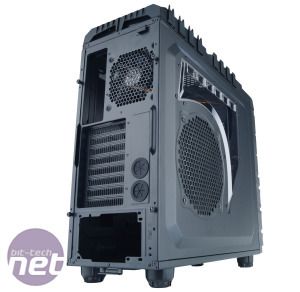 The inside of the case is fairly standard for a modern ATX case - there are few unique features or touches that mark the Overseer RX-I as a £110 case. 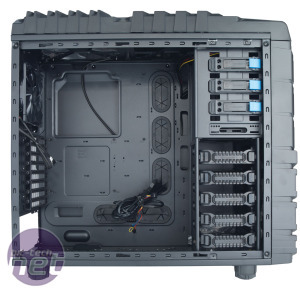 The whole interior is power coated black, which is thankfully becoming the norm these days, and there's a bevy of cable routeing holes located around the motherboard area, including a thoughtfully placed hole just for the 8-pin EPS12V connector. The mix of 3.5in to 5.25in bays is sensible too, with six of the former (one external) and three of the less useful latter. 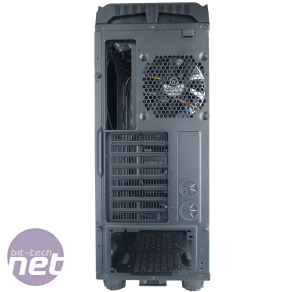 Providing the cooling grunt for the case are two huge 200mm fans, one of which is located as a traditional front intake while the other acts as a roof exhaust. These both light up with a soft blue glow when you power up the PC, giving the case a pleasant bit of personality and flair. There's no way to turn off the lights though, should you want to, which could be a pain if you keep your PC in your bedroom and need to leave it on overnight. 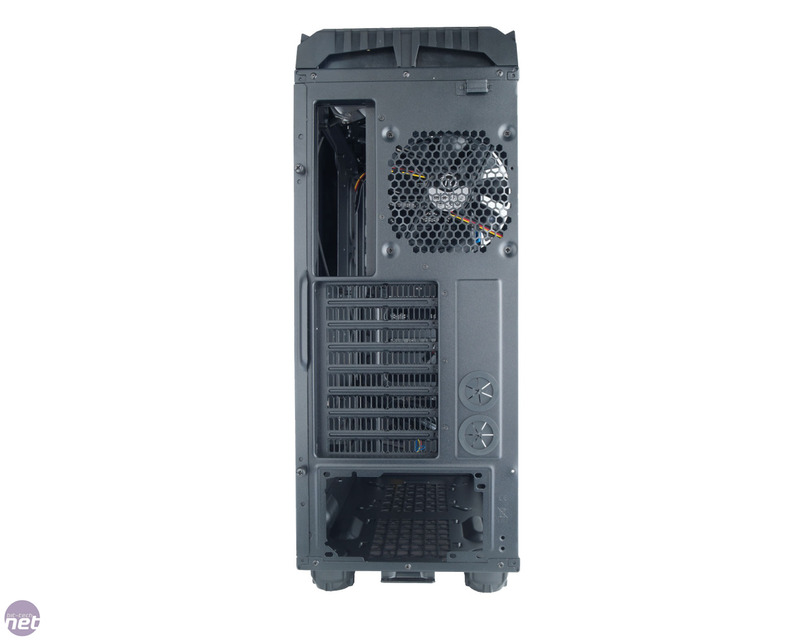 Rounding out the cooling apparatus of the Overseer RX-I is a single rear exhausting 120mm fan, although there are mounts for adding an additional 200mm roof fan and a 120mm floor intake fan too. 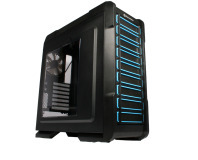 As you’d expect from a case at this price, the PSU also has its own dedicated intake vent at the bottom of the case. This is covered by a dust filter that's easy to remove and replace. Unfortunately, though, the same can’t be said for the front intake area, which is equipped with a dust filter that can only be accessed by removing the entire front fascia. This is a pain, and makes it more likely that you’ll just leave it there to get bunged up with fluff, stifling airflow, rather than cleaning it regularly as should be the case. 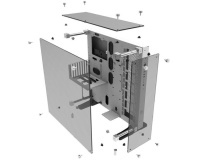 Drive bays 3 x external 5.25in drive bays, 5 x internal 3.5in drive bays. 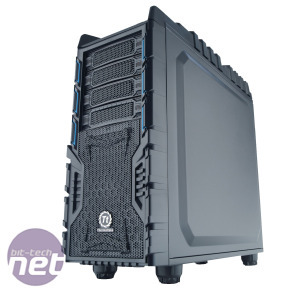 We put Thermaltake's new £80 Chaser A31 ATX case through its paces.